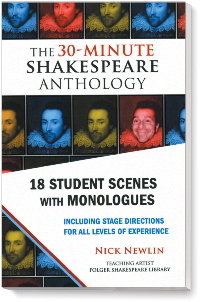 This acclaimed collection contains 18 abridged scenes selected from 30-minute versions of Shakespeare’s best-known plays in this popular series. Each scene includes a strong monologue, with nine for men and nine for women, and keeps the beauty of Shakespeare’s language intact. Every scene, ranging in length from five to fifteen minutes, features interpretive stage directions, detailed performance notes, and comprehensive monologue notes, all “road tested” at the Folger Shakespeare Library’s annual Student Shakespeare Festival. Read more...Folger Education promotes performance-based teaching of Shakespeare’s plays, providing students with an interactive approach to the Bard’s plays in a close reading of the text through intellectual, physical, and vocal engagement. Editor Nick Newlin is a teaching artist in public high schools under the auspices of the Folger Shakespeare Library in Washington, D.C. and offers the most readable and helpful tips about performing specific Shakespeare’s scenes — including suggestions of videos to watch — that we have come across.